Download this white paper to find out how Forrester evaluates the best vendors, how each vendor stacks up to Forrester’s criteria and the needs a digital experience platform must meet. Before your customers are your customers, they’re merely prospects who aren’t aware of your product, brand or company. Analyzing the customer life cycle is vital to strengthening your business and each organization must utilize all touchpoints, especially digital experiences to attract the always-on digital consumer. 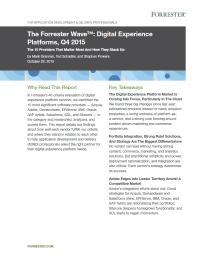 Forrester outlines how devising a digital experience platform architecture will help align strategies, teams, processes and technology to meet your business needs.